Now making buttered rice is super easy. You can even use leftover boiled/steamed rice from previous day. 2 table spoons salted butter. Now this one is all time favorite of everyone who loves his/her non-veg! But then why do I call it Kacche Gosht ki Dum Biryani? It is called so not because it has raw meat, LOL! 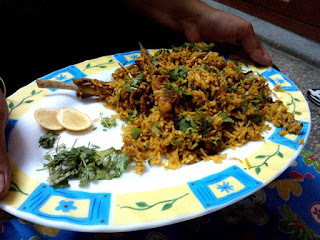 But because mutton is not cooked separately but with the rice. Normally in other Biryanis, mutton/chicken would be prepared separately and then mixed with rice and cooked further. 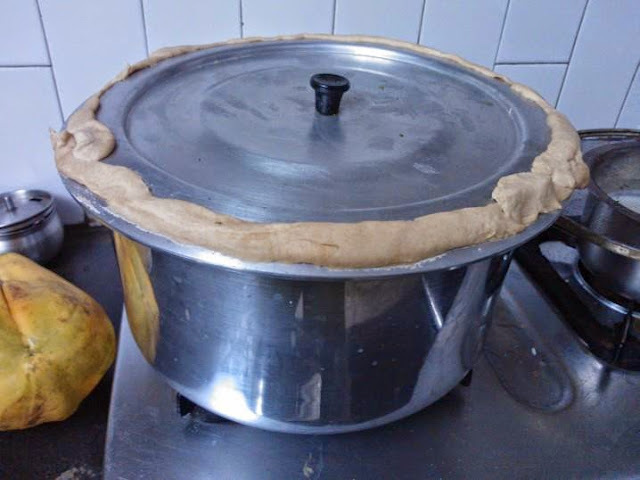 The rice and mutton are sealed like this and cooked on Dum. But let me also tell you, cooking Biryani is a tough task. It is a long process and you just cannot perfect it the first time. But, the result would be worth the effort. The first time I cooked it, my house was filled with such aroma and fragrance I had never felt before. My brother-in-law whom I invited for dinner mentioned to me at the door itself that it's fragrance is filled to the staircase. I could imagine my neighbors enjoying it too! Rice cooked in it's own Dum (steam) in indian spices along with marinated meat. We will marinade the mutton in the patila that we are gonna cook the Biryani in. Refer to picture above, I had used aluminium patila with thick base which is very important as it will save your mutton from burning. Put the mutton and hung Curd in and add all masalas in point # 5 in ingredients list except nutmeg powder. Add some ghee and ginger garlic paste. Mix well ensuring marinade covers all the mutton completely. Do taste the marinade as after this you will not be able to alter the taste. I wanted my Biryani to be spicy so I ensured that marinade was very spicy because this will also mix with rice. So, if your marinade doesn't have the spice, your Biryani will turn bland. Same with the salt. Leave it to marinade for at least 2 hours. Hi friends, Hope you have been eating good!!! Well this time I am going to share my experience of trying out mutton biryani and that too with a risk of mutton not cooking up well. But, in my first try, it worked out really well. Mutton was cooked nice and proper and tender & rice was not sticky and done good! I have been cooking curries and grilled/roast non-veg dishes but it was long time back that I had tried Biryani as a token of thanks to someone. (My brother-in-law). It hadn’t turned out that good though. Well, I know, just the thought of cooking biryani gives make people headache as its very complex in nature in terms of ingredients as well as the process and you do need the skill. And it also tests your knowledge of cooking utensils. And it’s not a recipe in which you separately cook mutton and then mixed with cooked rice. NO NO NO. It’s not call Biryani for heaven’s sake!!!! That’s cheating!!!! So, this time I thought of trying mutton biryani in which mutton is not pre-cooked but marinated and cooked along with half-done rice which is difficult. Its aptly names ‘Kachay Gosht ki Dum Biryani’. You may end of having mutton half-done or rice over cooked, either of which will spoil the dish. Also, I know many people don’t like to see those whole spices in their biryani like Cardamom, whole black pepper, cloves, cinnamon, etc. So, actually prepared this ‘Potli Ka Masala’ and boiled it in water and then cooked rice in that water. This adds all the taste and wonderful aroma of those spices without leaving any whole spices in the meal. Sounds tricky? Actually it’s easy! Now, my fingers were crossed when it was simmering away on low heat but I was lucky enough to have it done just right. Biryani came out really delicious without being spicy (even my twin boys could eat it). Well along with briyani, the best companion is the raita. You may try your own variety of raita but I did what I like the most, Jeera Raita!!! Yummy!!! Now this recipe, you basically half cook the rice. Layer it over marinated meat in a thick flat base (not round), layer is with some spices and then again layer with rice. You also seal the cover so that steam doesn’t escape, that is why it’s called Dum Biryani. However, tricky part is to ensure mutton is tender and cooked properly along with rice. Remember, add pure ghee in marinade and also while layering the rice because IF THERE IS NO GHEE, THERE IS NO BIRYANI.